We offer great value Cherry Picker Hire in Bournemouth and across the South East of England. MC Property Maintenance offer a number of high-level access platform machinery, including cherry pickers for hire, self hire, and experienced operators available for hire on a long and short term basis, we can help you choose the perfect machine for your next project. With experience assisting both residential and commercial clients in maintenance, painting and decorating services, we offer essential advice whether you are conducting necessary DIY work on your home or embarking on a full-scale construction project for your business. MC Property Maintenance offers cherry pickers for hire in Bournemouth and further afield as a cost-effective and safe alternative to scaffolding for any painting or decorating project. 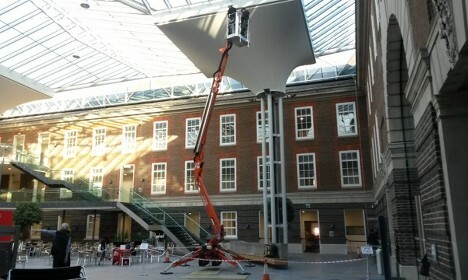 Cherry pickers can be used for decorating the interior and exterior of many different property types, including areas such as public shopping centres and even churches. If you have any questions regarding your next project, MC Property Maintenance is more than happy to help. Having established a strong reputation over the years for providing clients with high-level access platforms, MC Property Maintenance can offer assistance to businesses and companies of all sizes. From helping private clients in redecorating their homes to providing property maintenance and management and organisation advice on projects for large businesses and corporations, MC Property Maintenance is more than happy to help. We draw from extensive local experience in order to ensure client satisfaction in every decorating project undertaken. As an officially registered IPAF and CPA company, we work hard to ensure complete client peace of mind by offering secure and qualified workers and vehicles at all times. Self Hire – Our self hire service is designed for clients to hire on a short term or long term basis. The service includes a member of the team delivering the vehicle directly to your site where they will then stay while helping you to familiarise yourself with the machine. The vehicles we have available for hire include the TRACCESS 170, EASYLIFT R-160, CTE-ZED 21, EASYLIFT R-180 and the EASYLIFT R-150. Operated Hire – MC Property Maintenance provides operated access platforms for hire in Bournemouth as a cost-effective solution for long-term building projects. Operated hire ensures that a professional operative is always on hand to provide useful advice and assistance on client projects. Property Maintenance – MC Property Maintenance also provides a number of additional property related services as well as the self hire and operated hire of cherry pickers. The continual upkeep of your commercial or residential property is important, particularly with regards to insurance and maintenance. MC Property maintenance offer clients a range of services including gutter cleaning, high-level access painting and decorating, the treating of woodwork and more in order to help them keep their property in good order. Whether you are looking for self hire cherry pickers in Bournemouth, or you require professional assistance with an operated hire vehicle, the team at MC Property Maintenance are always ready to help. Get in touch with us today for more information about our range of property maintenance services. Simply fill out the enquiry form found below or on the sidebar to the right, or call us directly on 01243 262714. We look forward to hearing from you soon for information on cherry picker hire in Bournemouth.